Dogs Deserve Better is a non-profit organization whose mission is to create awareness, council owners, and save dogs whose lives are spent chained and/or penned. Behavioral science has taught us that dogs who spend their lives on the end of a chain are extremely unsocialized and, therefore can become a danger to all those around. According to their website (http://www.dogsdeservebetter.org/), DDB is a voice for chained and penned dogs, whose sadness speaks only through the eyes. As the days become years, many of these dogs sit, lay, eat, and defecate within the same 10-foot radius. Chained by the neck, they exist without respect, love, exercise, social interaction, and sometimes even basic nourishment. They live as prisoners, yet long to be pets. Because many citizens are not comfortable approaching / counciling owenrs of chained dogs to let them know the dangers and disservice they are doing to the dogs and to their community, DDB says, "Let us do it for you!" For the second year in a row, DDB has organized an event called "Have a Heart for Dogs Week", from February 7th - 14th. In the months prior to this special week, people can send to DDB the addresses of homes where chained dogs live. Today those dog owners (more than 19,000) are opening their mailboxes and receiving a beautiful, hand-made Valentine from a concerned child along with literature that explains the reasons that chained dogs suffer and a list of options on how to improve their well being. And, its making an impact! If you know of a chained dog, please don’t hesitate to reach out. The Dogs Deserve Better website is full of resources including literature in both English and Spanish (http://www.dogsdeservebetter.org/brochure.html) for you to submit to a neighbor either directly or anonomously. 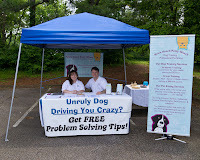 You can also check out this page for further tips on how to intervene: http://www.dogsdeservebetter.org/infotips.html. FROM KNICK KNACK PATTY WHACK! I have blogged previously about how good pumpkin is for dogs. 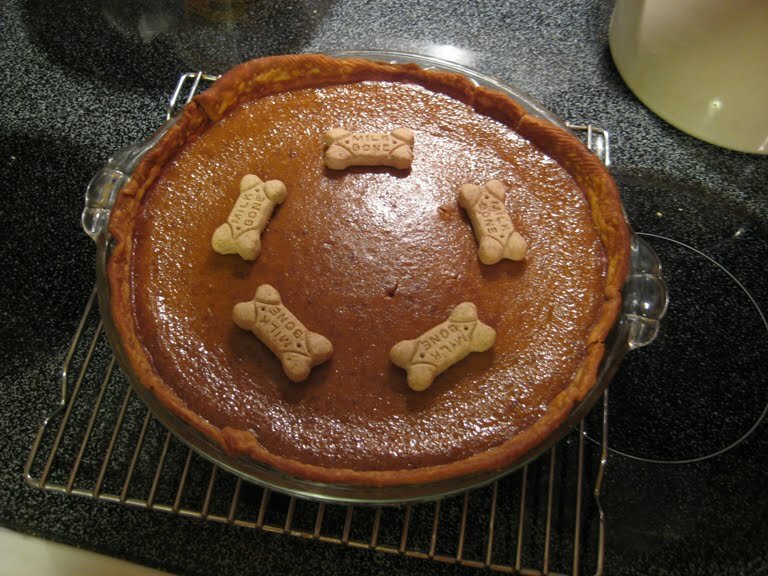 So, why not make your doggie a special pumpkin pie for Thanksgiving? Whip all ingredients together until thoroughly mixed. Pour into a wholewheat pie shell and bake at a preheated 375 degrees F for 60 minutes or until a knife comes out clean. 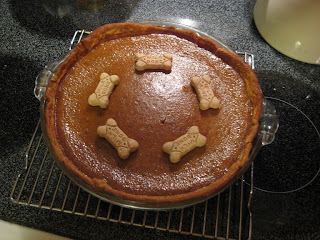 This puppy pumpkin pie will be rich, but not too sweet for your pooch to enjoy! I call this toy "Legs", because, as you will see, it seems to have four legs that hang down from a center knot. Start with six 3.5" x 30" strips of fleece in three different colors. Knot the end of each set of three strips. Braid each set and knot the other ends to hold the braids in place. Remember, the tighter the braids & the knots, the more durable the toy. Bend each braid in the middle and then loop the bends together. Knot the center using Leg #1 & Leg #2. 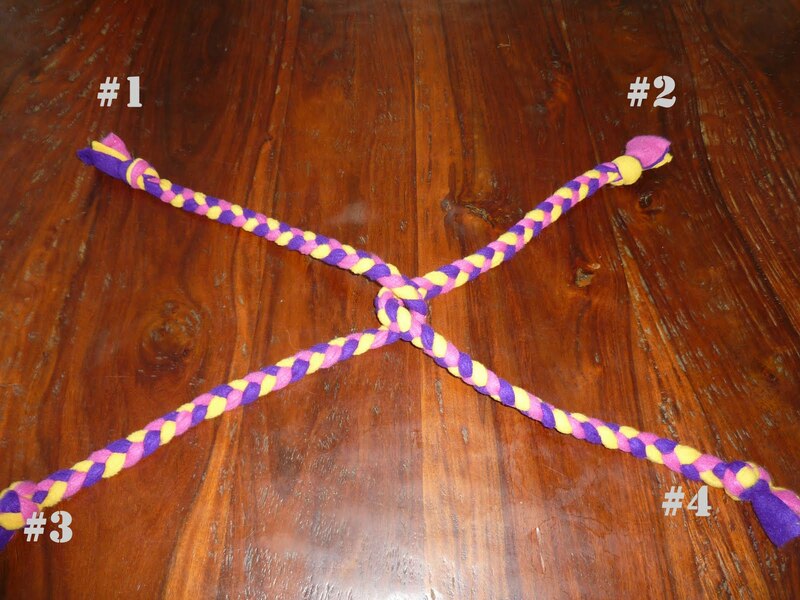 Then, tie another knot in the center using Legs #3 & #4. Next, tie a center knot using Legs #1 & #3. Lastly, knot the center by using Legs #2 & #4. The result should be one very large center knot. "Legs" toy - Finished product. This is a great toy for larger dogs. 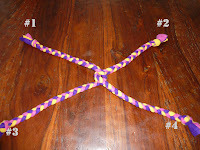 I call it the "Double Knot" toy due to the two large knots used to make the shape. Start with three strips of fleece. Each strip should be a different color and approx. 4" x 60" long. Knot all three strips together at one end. Braid the three strips together and knot the other end to hold the braid in place. Remember, the tighter the braid & knots, the more durable the toy. Then bend the braid at the center. Tie a knot about 4-5 inches from the top, to create a loop. Tie a second knot approximately 5 inches down from the first knot. And there you have it - the "Double Knot" toy! Our dogs thoroughly enjoy their fleece toys! And when they get dirty, we just throw them in the washing machine! If you find that you have plenty of extra fleece left over, why not make 5, 10, or even 20 of these toys for your local animal rescue or Humane Society. I'm sure the dogs would appreciate it! Just remember, as with all toys, these toys are for supervised use only. If you see that your dog is able to chew off and swallow pieces of the fleece toys, it is time to replace them. Thanks again to The Humane Society of Memphis and Shelby County for inviting Knick Knack Patty Whack to participate in their 2nd annual Fast & Furriest 5k run/walk! 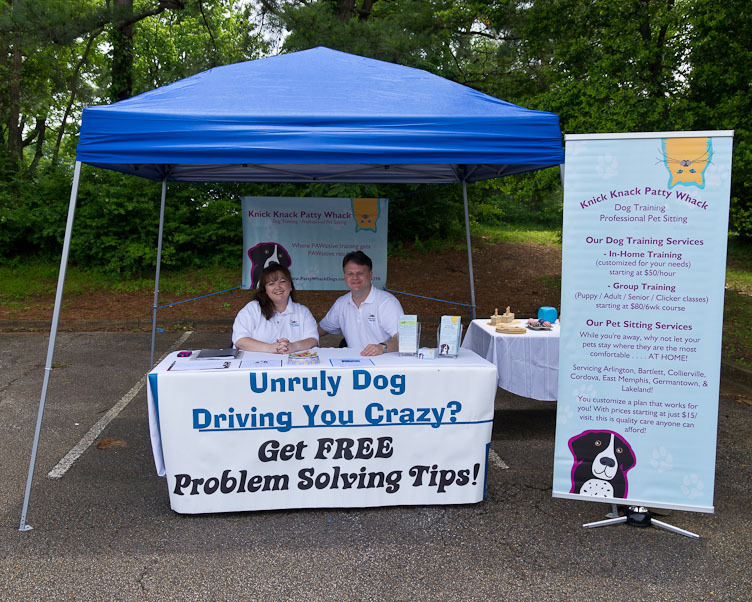 In addition to providing free problem solving tips for unruly dog owners, we were able to raise approximately $90 for the purchase of mentally stimulating / interactive canine puzzles for our Humane Society dogs. We will soon be implementing a new mental stimulation program for the awesome HS dogs in order to decrease stress and build confidence. Thank you for your support! So, you've likely been wondering what KKPW has been up to since our frequency posting to our blog has almost halted. As many of you know, we are Humane Society group leaders the Friday night dog walkers' group. There are lots of wonderful, adoptable dogs at our local Humane Society that need forever homes. Unfortunately, many adopters that come through the doors do not realize that the way a dog acts in a kennel envirnoment is not typical of the way the dog behaves in a less stressful environment, and the dogs suffer as they are not given a second look. Because of this, KKPW gained permission from the Humane Society to create videos of each of the dogs. These videos will be linked to a QR Code (example below) which we have affixed to each corresponding dog's kennel card. The potential adopter need only to scan the QR code with his/her smart phone, and they are taken immediately to the dog's profile containing a video of the dog playing in the yard, frolicking with other dogs & people, and doing tricks! It is our hope that these efforts will highlight how awesome these shelter dogs really are! Interested in adopting one of these sweeties? Visit http://www.memphishumane.org/ for more information! Though many owners understand a dog’s need for physical stimulation (i.e., exercise), they often fail to recognize that mental stimulation for their canine companion is of equal importance. Dogs who lack proper mental stimulation often become bored, which can result in numerous behavior problems, including some destructive behaviors, such as chewing, digging, escaping, etc. Owners of healthy, well-balanced dogs combine mental and physical stimulation in their dog’s daily activities. Mental stimulation can come in many forms. It can be something as simple as changing the route of your daily walks so your dog can sniff new smells and get a change of scenery. Or, it can be something more complicated like canine treat-dispensing puzzles. Teaching, practicing, and improving basic commands and tricks is also another form of mental stimulation. A general rule is, the smarter the dog, the more creative and/or complicated the mental stimulation that you provide needs to be. In this article, I will list various forms of mental stimulation that is suitable and appropriate for most breeds. Dogs that thrive on human companionship and affection are often easy to train, as they just want to please their human companions. With other dogs, you may need to find other motivation such as treats or a favorite toy. Just remember, you don’t choose what motivates your dog. Your dog chooses this. Teaching your dog basic commands, and then expanding on those commands, is a great way to provide mental stimulation. Take, for example, the Hide & Seek game. Once your dog knows the “Sit / Stay” and “Come” commands, put him in a “Sit/Stay” somewhere in your home. In the beginning, it helps to have another individual to stay with the dog and make sure he stays put. Now, you calmly walk away and hide somewhere in another part of the house. I like to have a tasty treat with me while I’m hiding. Now loudly say the word “Come” or “Find” so your dog can hear you. Once he finds you, ask him to “Sit” and then reward him with praise and a treat or favorite toy, depending on what motivates your dog. In the beginning, your puppy may need some coaxing to help find you, which is another reason why a second person may be helpful. Remember to keep your energy level excited, to make it more fun for your dog! Another fun game to play with your dog is the Hidden Treasure game. This is a simple game and can be played anywhere your dog is allowed off leash (assuming there are no other dogs around). Take a scoop of your dog’s favorite kibble and toss it out in the grass. Your dog, assuming it has been at least a few hours since his last meal, will spend a good 20 – 30 minutes trying to locate all the kibble. We like to play this game with our dogs when we have a good snow on the ground. The kibble will fall a good 2-3 inches into the snow and our dogs have to use their nose to find it and dig it out! Follow the Leader is a good way to teach your puppy to remain focused on you and can eventually be used to teach your dog to “Heel”, if you’re sure to keep your dog on the left side. With very tasty treats in your hand, say to your dog, “Let’s Go” and then begin walking. In the beginning, you may need to hold the treat down near your dog’s nose to keep him motivated to follow you. Don’t give him the treat yet, though. When he least expects it, suddenly stop walking, turn around and ask for a sit and then reward with a treat. As soon as he finishes chewing, say “Let’s Go!” and repeat the game again. In the beginning, you may need to reward your dog with a treat after every few steps in order to help him learn this game. If your dog gets bored, you may need to “up the ante” with tastier treats. These are just some examples of some one-on-one games you can play with your pooch, in order to provide that much-needed mental stimulation. If your dog seems to get bored with the game, try increasing the reward value (i.e., use a tastier treat). And remember not to play the games so long that your puppy becomes bored with them. You want to give your puppy plenty of mental stimulation, but you also want to leave your puppy wanting more so he will look forward to the next time the two of you play the game together. The best thing about these games is it also helps to solidify a life-long bond! Twenty minutes of a dog playing with an interactive/treat dispensing/puzzle toy is equivalent to a one hour run, according to The Association of Pet Dog Trainers. This is due to the amount of energy expended when your dog works his/her brain. This, of course, is not a substitute for good physical exercise, but when used in connection with exercise, you are much more likely to have a well-behaved dog. A favorite line among us trainers is, “A tired dog is a good dog.” This is SO true. Just remember, when puppies are young, their stomachs are more sensitive. Accordingly, some of the things discussed below may be inappropriate for very young dogs. IMPORTANT NOTE: Always supervise your dog while he is playing with toys. The Kong is an old faithful for dog trainers and is a perfect example of a treat-dispensing toy, which is a great way to provide mental stimulation. This toy is top-shelf dishwasher safe, so be sure to clean and sterilize it after each use. OUTDOOR USES: For Hot days, try the Kong Frozen Jerky Pops! Smear a small amount of peanut butter over the small hole at the top of the Kong. Fill the toy with cool water & add a pinch of bouillon. Place jerky strips inside the Kong. Cover the top hole with peanut butter. Freeze. Some dogs love the water. If yours is one of those, you can place the frozen Kong in a children’s size swimming pool for a fun day of “fishing” for your dog. If you have some strong rope, thread your Kong and tie a knot at the top, so that the Kong will hang upside down by the rope. Then, tie the Kong in a way that it hangs, upside down, just above your dog’s nose when all four feet are on the ground. Fill the Kong with your dog’s favorite kibble, and watch him jump and work to get the kibble out of the Kong (not suitable for very young puppies). A Kong is just one example of the many treat-dispensing toys available on the market today. Visit your local pet store for some more ideas! Since some treat-dispensing toys can be costly, here is an example of a treat-dispensing toy you can make yourself – The Peanut Butter Jar. Simply finish off a nice jar of peanut butter. (I’m sure your dog would love to assist you with that!) Then, cut 3 or 4 holes in random places around the sides of the jar. Also, cut a hole in the top. Make sure the holes are big enough for pieces of kibble to fall through. Fill the jar up with your dog’s favorite kibble and then watch your dog roll the jar around on the floor, trying to get the kibble to fall out of the holes. If you find that your dog easily gets the kibble out, you can increase the difficulty level by adding up to three pieces of the cardboard roll that is left after you use up a roll of aluminum foil. However, you’ll want to slowly increase the difficulty level, so just add one piece at a time. And, make sure the pieces are of varying lengths. I am a huge fan of Interactive Dog Puzzles. In addition to providing mental stimulation and tiring your dog out, puzzles (1) help to build confidence in an insecure dog; (2) help develop problem-solving skills; (3) decrease stress levels; (4) relieve boredom; and (5) help to increase attention spans. Additionally, it is much easier to increase the difficultly level of puzzles for your dog. As long as you don’t use the same puzzle over and over again, your dog should never tire of them! COMMERCIAL PUZZLES: There are many interactive dog puzzles on the market today. Unfortunately, the majority of these puzzles can cost as much as $85.00. For some more affordable options, including puzzles as low as $14.99, visit our website (http://www.pattywhackdogs.com/p/training-aids-shop.html) to see some of the puzzles currently available. HOMEMADE PUZZLE: In the mean time, here are some examples of some homemade puzzles you can make yourself. Since most dogs have to start of when easier puzzles and then work their way up to the more complicated puzzles, the Muffin Pan Puzzle is great for beginners. Simply put a tasty treat in each cup of the muffin plan. Then place a tennis ball on top of each treat. Your dog will have to figure out how to get to the treats under the tennis balls. Some dogs will use their mouths. Others prefer to paw at the balls. Just remember, if your dog’s mind is working, you’re providing mental stimulation! In extreme temperatures, all dogs are at risk - even dogs who you feel may be acclimated to hot weather. However, air temperature is only one consideration. Humidity, sun exposure (or lack of shade), amount of time in the heat, the level of exertion, and availability of water can all affect how well a dog tolerates heat. Be aware of signs of heat distress, such as excessive panting or drooling, reddened gums, listlessness, or rapid heartbeat. Fortunately, there are plenty of ways to help prevent your dog from getting so overheated that he suffers heat stress or heatstroke. 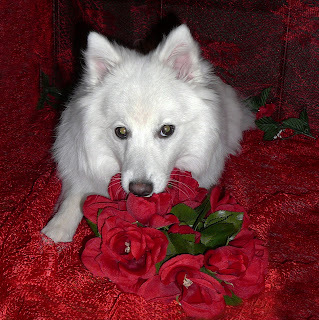 1) AVOID EXPOSING YOUR DOG UNDULY TO EXTRAORDINARY HEATH. If you must leave your dog outside, ensure he has ample methods for staying cool - plenty of shade, lots of fresh, cool water to drink, and perhaps the cooling breeze of a fan. 2) MODIFY YOUR DOG'S EXERCISE ROUTINE IN HOT WEATHER. Walk him after dark or before dawn. Incorporate swimming or water play into your dog's usual game of fetch. During severe heat, forego any sort of rigorous exercise for a few days. 3) GET HIM WET. Hose your dog down, put him in the tub, mist him with a spray bottle, or wipe his coat with a sopping wet towel. In a dry climate, the evaporation will help lower his body temperature. In a humid environment, you'll need to get some extra air flowing over him for a wet coat to help him cool down. 4) PROVIDE AMPLE WATER. Make sure your dog has lots of fresh, cool water - preferably from more than one source, as dogs always seem to drink more when they have more options. 5) USE AN EVAPORATIVE COOLING VEST, COAT, BANDANNA, OR MAT. There are plenty of these products on the market. Look for garments that are wetted and gradually release water through evaporation (example: HyperKewl Evaporative Cooling Dog Coat by TechNiche International). But in a pinch, even a plain cotton T-shirt or bandanna, wetted and worn by the dog, can help provide some evaporative cooling.